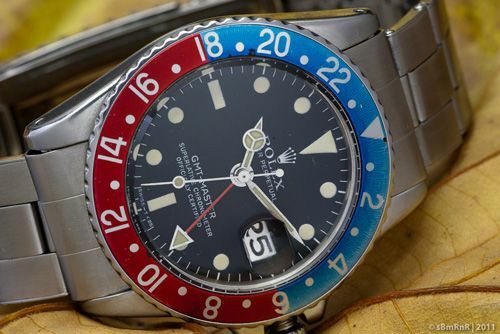 The Watch Photographer, friend of the show and famous because of his Rolex calendar is now offering his beautiful Rolex GMT-Master ref.1675 (ca.1971) for sale. We can easily say that this is the most popular GMT-Master of this moment and still considered to be affordable when it comes to collecting vintage Rolex watches. What once started as being the watch for (PanAM) pilots, grew out to be the most popular watch for travelers of all sorts. The current GMT-Master II ref.116710LN is the result of decades of small and well thought-of tweaks and adjustments to the original GMT-Master, such as the ref.1675. GMT-Masters prior to the ref.1675, carry the 6542 reference number (1954) and have no crown guards and was soon to be replaced with the ref.1675 in 1959. 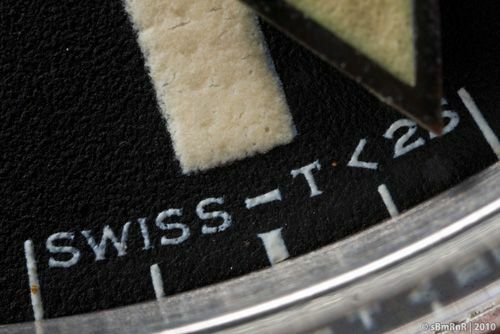 This beautiful version of the GMT-Master 1675 still has the typical fat lugs that you only see on Rolex watches that have stayed away from polish treatments executed by non-Rolex service centers. The watch comes with a jubilee bracelet (the watch above is pictured with an Oyster bracelet though) with reference 6251H, perfectly fitting this GMT-Master. Price is set to 3950 euro. Contact the Watch Photographer directly through his website or via Facebook.